Yeah, I focused too much on removing cards in the beginning. Now I usually end up with a pretty beefy deck, rendering the not so useful strikes less of an issue. I also reached the new chapter the other day - pretty brutal stuff for my poor ironclad. When I was working on completing a run with the Silent I found there were some of the daily challenges that were easier to complete than playing normally. You often get way better starting decks that you can refine, rather than having to build from scratch. Useful, because I find the Silent quite hard to hit the right balance of offense and defense, and since you typically have no sources of health a turn of bad draws can take off huge chunks of your health. I ran the poison build last night and cleared a run with the Silent. I ran with 1 Legwork for the dex bonus, 2 Adrenaline+ for the extra energy, 1 After Image+ so I’d always be able to get extra armor for playing cards, 2 Backflip, 1 Blur, 5 Bite, and 5 Deflects for free block, 2 escape plans for drawing/block, and 2 Noxious Fumes+ for the passive poison damage stacks. I had one Neutralize as well, was hoping for more but they didn’t come up. Didn’t really make a difference though. I removed nearly all standard blocks and strikes from my deck (traded the strikes for the bites). Really fun! By the end of the run, I had so much armor that nothing could even scratch me, so the bites I picked up were just added damage on top of the poison, couldn’t really heal. I’m hoping the next time I try this, I can get another Blur or two. Having armor carry over to the next turn is insanely useful. Now to get through with the Defect and I’ll have done all 3 characters. And, as you mentioned in the other thread, I apparently will get to see a new boss after that! I thought all there was left was the Ascension mode. Blur and After Image are so flippin’ good once you get them running. Whew, I’ve beaten Corrupted Heart with Ironclad finally. (see screenshot thread). Basically it was god tier run, got all the right ingredients and even couple extra that made me basically invincible. With toxic egg in the middle of run I run into event that has given 5 upgraded Apparition card, a real godsend in final fight. Even better I had upgraded Barricade and was able to buy Bottle Tornado to have it at the start of the combat? Yes, please, what’s more I’ve got Anchor so opening 10 armor on each fight and then Entrench and couple of Body Slams and Runic Pyramid? Holy molly, it was just stacking blocks while Apparition took care of any incoming damage and then body slamming enemies into oblivion. I can send a seed if someone wants a satisfying run. Now onto Defect, problemis I have no idea what build can work with heart with this guy? Any thoughts? Probably stacking end evoking lots of forst orbs+blizard spam? I really don’t know, the most successful runs I’ve had with him have been insane amount of powerful power cards, mostly foregoing the orbs, save maybe a darkness for scaling. I’m confused by people saying they have to beat the game with Silent to play with the Defect. I just played a single game with Silent (not a win) and immediately got the Defect. Good thing too, as I have been completely failing to get very far with Silent, normally with it all falling apart around d the middle to the end of Act 2. Only won with the Ironclad so far, although I have gotten pretty close with the Defect a few times. I really love his orb mechanics. I had a particularly good run with lots of ice orbs and a couple of cards (Blizzard, I think it was called) that did more damage for each ice orb generated. Lightning has seen me go pretty far too, particularly the with the power that makes lightning hit all enemies twice. After a time away from the game I’ve had a few runs recently on ascension level 1, but haven’t managed to beat the act 3 boss. In all the runs I didn’t really get a good combo going, and struggled through until falling in act 3. Last run I was only 1 or 2 turns from beating the awakened one, but never really felt in control. I’m starting to wonder if I should start quitting after act 1 if I’m not happy with my deck, rather than trying to struggle through with what I have. I’m confused by people saying they have to beat the game with Silent to play with the Defect. I just played a single game with Silent (not a win) and immediately got the Defect. Very much agree with the potions being too tucked away. I always forget to use them and they can be real game changers. Particular ones I’ve found useful are the artefact ones to block some of those special nasty debuffs, like hexes, and the ones that give you additional energy. Just tried out a Daily Challenge and that was a lot of fun. I managed to complete the run and was putting out some insane amounts of damage. To be honest, much of the time I wasn’t even sure where all my damage was coming from, with cards comboing off of each other left, right and centre. I definitely see why some people say that Silent can be really powerful now, with lots of opportunities to be able to play a lot of cards in a single turn and a few powers that really capitalise on doing so. The Challenge Mode has also made me really appreciate how having a big deck is not that much of a setback. Stacking your deck with lots of cards actually does seem like it can open up a lot more interesting stuff going on and is probably more effective than hoping to get that perfect deck of 20 or so cards that you are only ever going to get every few thousand runs. Artefact potions can be crazy helpful. If you quaff a +5/-5 dex/str potion with one charge of artefact, you don’t lose the dex/str after the turn. Super helpful for bosses. Also works with some cards that have downsides like Wraith Form on Silent or Biased Cognition on Defect. That’s one reason the card that gives charges of artefact can be really strong (Panacea). Just make sure the charge is there before you play the card with the negative effect. Woa there … that’s huge! I’ve mainly ignored artefact effects until now, but with this information I can see that there is a lot of potential. Definately going to check that out. Just had 3 ironclad runs in a row ended by elites in act 1 (2 gremlin nobs, 1 Lagavulin). I think I need to change my strategy of going for as many elites as possible in act 1. That’s seriously good info. I got screwed by Biased Cognition fighting an act 2 boss. I ran out of focus right before the boss ran out of health. Screw Gremlin Nobs, though. It’s so hard to come through that without needing to eat some pretty hard hits. Whew, beaten the game with Defect. Ok, it’s done for me. Done and dusted. Ascension? No, thank you, at least not with a couple months break anyway. Steam says 160 hours. Whoopsie. Fantastic game. I basically steamrolled Time Keeper, but later on I was stomped by Corrupt Heart, because I wasn’t able to set up me defenses in 2 turns. So in this final run, I got a bit different strategy I struck luck on getting Mummified Hand relic. It causes that playing power card causes other card to costs 0 that turn. I had two copies of Creative AI (add random power card) and White Noise that add random power card, so basicaly it power card spam that cuased other cads to cost 0 turn and drawing even more power cards and spamming them to get things going. Things got a bit crazy and I was a bit too excited and ultimately only made it by last ditch, even having crazy setup prepared. Holy bird cults that’s a lot of focus. 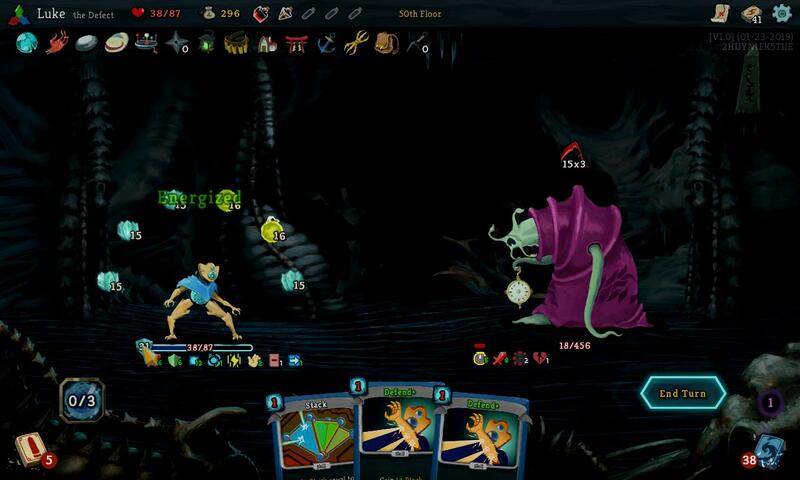 It was at the point that I realized “when I have the mummified had I win, when I don’t I lose” that I stopped playing Slay the Spire. Icecream is also fairly nuts. Anything that cheats the energy system. My win with the Defect involved trying to get enough card draw to spend all the energy I could generate, and throwing in a couple of Claws since I was drawing so many cards. 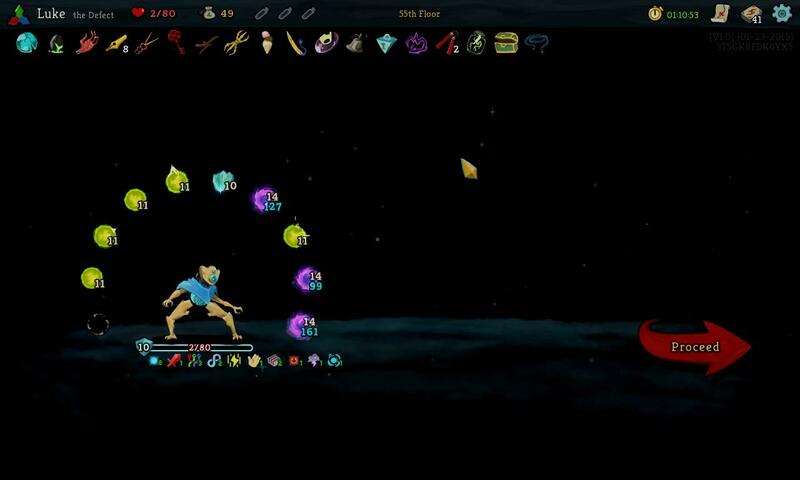 My best run has also been with the Defect. I managed to get a small deck with mostly 0 cost cards, including Claws. I additionally got the Spinning Top, which draws a card, when your hand is empty. That woudl cycle through my deck multiple times per turn, I got multiple turn 1 kills with that (and the achievement to play 25+ cards per turn). This is the beauty of this game, so many ways to build awesome decks. And since it’s singleplayer and you only keep your deck for your run, you can do all sorts of crazy stuff with it.